The Best Student Projects That Need Family Engagement — Contribute Your Lessons! Be sure to check out the comments section for even more great ideas! I’d like to create a very lengthy list of lessons that require students to engage with their parents and families in a positive way. I know I’ve previously posted about some, but I need to track them down. I’m also hoping that lots of teachers will send in summaries of successful lessons that they’ve done. I’ll add them to list and, of course, give you credit. 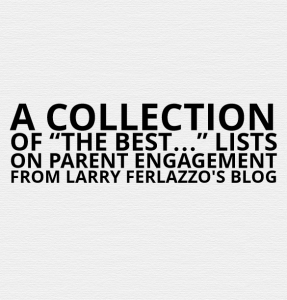 You can find all my parent engagement-related “Best” lists here. Curious Homework: An Inquiry Project for Students and Parents is by Suzie Boss. Good Teachers Embrace Their Students’ Cultural Background is an article from The Atlantic. Culturally responsive teaching doesn’t mean lowering standards, Irvine says. Take dialect, for example. Teachers need to help students speak and write in Standard English, but they’ll be more successful in that effort if they begin by respecting the way a student and his family speak at home. …During a seven-week trial during the 2010-11 school year, 192 students in nine 8th-grade classes were given one assignment each week using the Teachers Involve Parents in Schoolwork, or TIPS, program, which includes assignments that require students to discuss concepts they learn in class with a family member to complete projects. 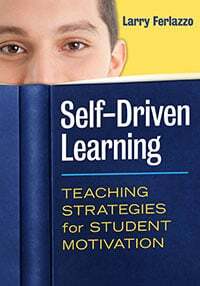 is a PBL lesson from the Buck Institute where students interview a family member about their life experiences and then create a nonfiction narrative based on a story from the interview. From here students then publish the collection of stories using an online publisher and organize a book launch event to the stores with family and public. I did project last year and it was amazing! I am in the middle of it right now and I still love project! Every year to start our measurement unit, I don’t assign any math HW except to have the students cook with their parents. Always a huge success. Here is my link. I published a post titled The Importance Of Telling “Family Stories.” In it, I discussed an article that reviewed a number of studies that found value in parents telling their children about family stories. The Washington Post wrote a more in-depth piece about one of those studies, and included a pretty useful “Do You Know” series of questions that teachers could easily give to students as an assignment. I love projects that require students asking their parents questions, and this one would be perfect. @Larryferlazzo I compile a list of family friendly field trips that match our curriculum. I made up a treasure hunt for our local museum. @Larryferlazzo I encourage families to go to parks to identify physical landforms and go geocaching for geo skills. As an art teacher, I invite student’s families (and school faculty members) to our critiques at the end of a major unit or project! Students get to know other faculty, especially administration, parents are welcomed into the classroom, and it brings a sense of community to everyone involved! The Beginners’ Guide to Connecting Home and School is a post from Edutopia that shares some good ideas for joint student/parent learning projects. Keep Parents Connected in the Middle Grades is a good post at Middleweb that shares a number of good student projects that also involve their families. The Maine Education Policy Research Institute has just published what appears to me to be a very useful study on parent engagement. A summary of it can be found here, and the entire report can be viewed here. I’ve only had a chance to scan it, but it looks helpful. One section that stood out to me was on student homework projects requiring family involvement. I don’t recall seeing previous research on that topic. Highbridge Green School students present a project their parents helped design is an article in Chalkbeat NY that appeared last year, but that I just saw. It’s a short and sweet piece about a joint student/parent learning project. Anyone who’s every listened to NPR is probably familiar with StoryCorps, and I’ve published several posts sharing their resources. They just unveiled a new free mobile app at the TED Conference that allows anyone to record an interview with anyone and upload it their new site, StoryCorps.me. They have both iPhone and Android versions, and they’re great! The app provides multiple suggestions for questions, depending on who you are interviewing (you can also add your own). It’s a perfect tool for having students interview their parents, grandparents or other older family members (which also makes it easy to ensure students have parental consent — by the way, their policy states users must be over 13). It’s super-simple to use. Of course, classmates could also interview others, as long as teachers had parental permission. Honoring Our Families’ Immigrant Narratives is from Edutopia. I’ve had mixed results with family-engagement student projects, ranging from delight to disgust. I required honors biology students to create a bug box and collect 50 different insects. Some parents embraced the project, finding insects in stores and collecting during vacation. Other parents said it “ruined the summer” (really?). Another activity was a Rube Goldberg assignment. This was to be done at home and video-taped for in-school presentation. The students enjoyed it overall, and some parents really got into it; other parents, however, did not enjoy the clutter. I am doing the Rube Goldberg again this year and trying to modify the directions so that it is smaller and more pieces can be built in school. I’ve come up with a project that I am using when I teach Environment and Sustainability. Students keep track of how much trash they produce over the course of a week (they can keep track of how many trashbags they use). Then they decide with their family ONE specific waste product that they could do without for a week, such as soda bottles or cans, food boxes, etc. They then keep track of how much trash they produce during the second week, and compare. I also include a 500 word essay.